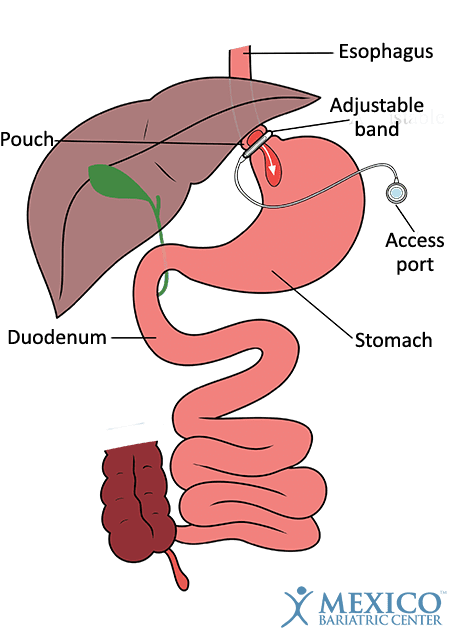 Gastric Banding (also known as lap band and gastric banding) is an inflatable silicone ring implanted laparoscopically over stomach to restrict food intake. This procedure was once the most common surgery in the United States and Canada. However, the lack of long-term weight loss and its safety concerns has mostly declined its use. Most patients with lap-band have failed to lose weight and have had too many complications. Lap-band could still be a good option for patients who can get after-care support and follow the diet after the procedure. Undergoing lap band surgery in Mexico can save patients thousands of dollars, all while being performed by a certified bariatric surgeon who potentially has equal or more experience than their United States surgeons. 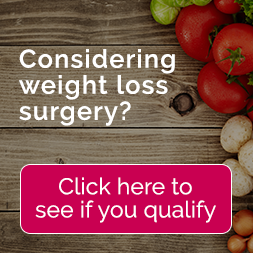 All of our qualified weight loss surgeons perform LAP-BAND surgery in a full-service hospital. Gastric banding, or LAP-BAND, is a type of bariatric surgery designed for people with the obesity problem, usually with a body mass index (BMI) of 30 or greater with comorbidities, such as sleep apnea, diabetes, osteoarthritis, GERD, high blood pressure, etc. Gastric banding has been performed over 750,000 times and was the second most popular weight loss surgery in the United States. Gastric Banding is, however, used to rescue other surgeries like Gastric Bypass. Contact our helpful staff at Mexico Bariatric Center to learn more about gastric banding surgery and receive a free quote. Gastric banding surgery is colloquially known by brand names of the implants: Lap-Band System or REALIZE system. Both implants are very similar and use the same surgical method to induce weight loss – restrictive technique. Gastric banding surgery, or adjustable gastric banding surgery, is performed laparoscopically. This allows our surgeons to use multiple small incisions, instead of one large incision. The LAP-BAND surgery in Mexico is a minimally invasive surgery, which has advantages over traditional surgery. Advantages of gastric banding include faster healing and less risk to the patient. Gastric banding works by using an implant to restrict the upper portion of the stomach and create a pouch. The band also induces a smaller stomach capacity. The lower size makes patients feel fuller faster, making them reduce their caloric intake. Gastric banding does not change the digestive tract. The band is adjustable allowing your surgeon or physician to alter the tightness of the band. Is Gastric Banding for Me? To be considered a candidate for gastric banding surgery, patients must meet or exceed a BMI of 35. Because BMI is not accurate for everybody, patients who are at least 100 pounds overweight are considered good candidates for gastric banding surgery. Patients who are severely obese, patients whose BMI is over 45, are not qualified candidates like this the recommendation would be gastric bypass surgery. Patients are also expected to have co-morbidities that are threatening to the patient. Co-morbidities including type two diabetes, high blood pressure, high cholesterol, are examples of things that look favorable during the surgeon’s review of your health history. Undergoing gastric banding surgery in Mexico can save patients up to $10,000. Expenses in the United States and Canada will typically range from $15,000 and up. LAP-BAND surgery in Tijuana, Mexico costs start at $5,495 at Mexico Bariatric Center which includes all the costs associated with the surgery – including hotel (excludes airfare, if needed). Learn about the cost of gastric banding if you have no insurance. * Prices are subject to change. Not valid on blackout dates. Prices depend on surgeon, surgery, additional fees, and schedule. Prices may rise because of BMI level and previous abdominal surgeries. Last Updated: January 11, 2018, by Ron Elli, Ph.D.